410 Web Media specializes in dynamic web presence development that allows clients to more effectively tell their story. 410 Web Media is a local leader in digital media strategies and brand development. 410 Web Media strategies aim to enhance marketing, advertising, lead generation and public relations efforts through social networking and web presence development. The company’s philosophy is based off of a unique approach of incorporating social media technologies into existing business marketing in order to expand exposure, extend networks, and leverage brands. 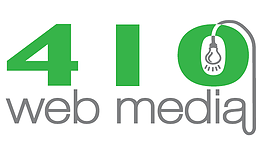 410 Web Media services include branding, marketing, advising, content development and copywriting, web design, graphic design, web management and comprehensive analytical reporting and research.